Read Dr. Paul Bloom’s 6-step plan for tackling pruritus in your canine patients. This article includes a list of questions to ask the owner during the history and physical examination; tips on how the answers, as well as clinical signs and diagnostic results, help narrow the diagnosis; and a tailored treatment plan that helps eliminate differential diagnoses while focusing on the dog’s comfort. Pruritus (Figure 1) is one of the most common reasons dogs owners seek veterinary care. The diseases most likely to cause pruritus in dogs include environmental- or food-triggered (cutaneous adverse food reaction, CAFR) atopic dermatitis (AD), bacterial pyoderma, dermatophytosis, ectoparasitic infection, and Malassezia dermatitis. Figure 1. Alopecia, scale, and erythema present in dog with Malassezia dermatitis secondary to environmental allergen-induced atopic dermatitis; treatment of the infection decreased pruritus by 90%. Over many years of specializing in dermatology, I have had the opportunity to evaluate a variety of approaches to diagnosis and treatment of the pruritic dog. The following 6 steps outline what I’ve found works best for diagnosing and managing this common problem. Where on the body did the dog begin itching? Where is it itching now? Feet, face (Figure 2), flexor surfaces, and frictional/skin folds: Consistent with AD (see Canine Atopic Dermatitis). Figure 2. Lichenification, hyperpigmentation, and erythema present in the skin fold of a dog with cutaneous adverse food reaction. It is critical to rule out other causes of pruritus, such as ectoparasites or infectious causes, before applying these criteria to a pruritic dog. This is due to the fact that, if 5 of Favrot’s criteria are matched, sensitivity and specificity are approximately 85% and 79%, respectively, which means that, using only Favrot’s criteria, an incorrect diagnosis will be made approximately 20% of the time. Evaluation of response to treatment. A combination of 5 satisfied criteria has a sensitivity of 85% and specificity of 79%, differentiating dogs with cAD from those with chronic or recurrent pruritus but not cAD. Adding a sixth fulfilled parameter increases specificity to 89% but decreases sensitivity to 58%. At what age did the clinical signs first appear? Age of onset of the first episode of pruritus (or otitis externa, which may be a manifestation of AD) may indicate the cause of pruritus. Are there any gastrointestinal (GI) signs, such as vomiting or diarrhea? These signs could indicate CAFR; food reactions can cause concurrent GI and cutaneous signs. Do clinical signs vary by season or location? Seasonal variation could be consistent with flea allergy, or allergies to trees, grasses, or weeds. If the dog exhibits increased pruritus while outside, outdoor allergens could be the culprit. However, if the dog exhibits increased pruritus indoors, this suggests a reaction to household allergens, such as dust mites or mold. Using a scoring system of 0 (no itching) to 10 (severe, nonstop itching), how pruritic is the dog today? Is this better or worse than previous days/weeks/months? By establishing a baseline during the initial visit, and reevaluating the severity of pruritus at subsequent visits, the dog’s response to treatment can be evaluated. If the pruritus is increasing in severity, consider concurrent bacterial or Malassezia infection or ectoparasite infestation. Has the dog been treated previously for pruritus? If so, when and with what medication(s)? What was the response to treatment? Are any parasite preventives administered to the dog? How often and in what form? Are the preventives administered seasonally or year-round? Dogs should be receiving preventives for both ecto- and endoparasites, with administration based on manufacturers’ instructions. Any lapse in administration, including preventives administered only seasonally, could be an indication that the pruritus is a reaction to parasitic infestation. What does the dog eat? A comprehensive list should outline the dog’s diet (eg, dry/wet food, treats, table scraps), ingredients and preparation (eg, commercial, home-cooked, raw), and amounts. This information can provide insight into potential CAFRs. Are there any other pets in the household? If so, do they have similar clinical signs? If there are cats in the household, do they go outdoors? Evaluating the health and lifestyles of the household’s other pets can provide various clues regarding the cause of pruritus; for example, if all pets in the household are affected, infectious disease is a likely candidate. Are any humans in the household affected by recent skin “problems”? If so, what kind? If humans and pets in the household are exhibiting similar skin problems, a zoonotic disease should be suspected. Does the dog visit places outside the home, such as obedience school, dog parks, the groomer, or a boarding facility? If so, when was the last time the dog traveled away from home? Exposure to other pets and environments opens the door to a variety of causes for pruritus, including infections and allergies. Do the dog’s parents or siblings have pruritic skin problems? If so, has the pruritus been diagnosed and treated? What was the response to therapy? Certain diseases and dermatologic conditions, such as eAD, endocrinopathies, and Malassezia infections, have recognized breed predispositions, which can help narrow the list of differential diagnoses. Evaluate distribution of lesions (erythema, excoriations, lichenification, hyperpigmentation, alopecia, etc), which can provide insight regarding the cause of pruritus. Determine if there is evidence—papules, pustules, exudate, crusts—that suggests a secondary bacterial or Malassezia infection/overgrowth is present. If any of the tests above are positive, treat the dog as described; then recheck in 14 to 21 days. Figure 3. Papules, hyperpigmentation, and epidermal collarettes in a dog with a superficial bacterial infection due to long-term administration of glucocorticoids for treatment of environmental allergen-induced atopic dermatitis. Figure 4. 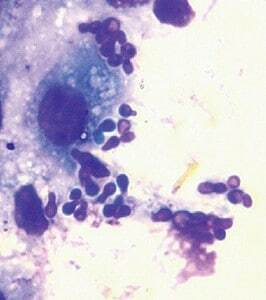 Skin cytology from a dog with Malassezia dermatitis; note the basophilic peanut-shaped budding structures consistent with Malassezia pachydermatis. There are also 3 keratinocytes present. Note that this is off-label use of these products. If the household’s dogs and/or cats are not receiving preventive containing lufenuron, the household should be treated with a product containing an adulticide and an insect growth regulator/inhibitor or undergo a professional extermination. If pruritus is generalized and infection is very localized, a short course of oral prednisone is appropriate in order to address skin inflammation. If pruritus is only located in the same area as infection (or mostly where infection is located), such as in the presence of demodicosis, bacterial pyoderma, or Malasseziadermatitis, then steroid use should be avoided. Prednisone, 0.5 mg/kg PO Q 12 H, or prednisolone is typically the steroid of choice and administered for 5 days. The first recheck appointment should take place 14 to 21 days after the initial appointment (Steps 1 through 3). Resolved ectoparasite infection: Discuss long-term prevention of ectoparasites with clients. Seasonal AD: The dog was most likely pruritic due to a secondary infection, not seasonal AD; therefore, now that the infection has resolved, so has the pruritus. Discuss long-term management of AD with the clients (Step 6). Endocrinopathy: Endocrinopathies (hypothyroidism or hyperadrenocorticism) predispose dogs to pruritic pyoderma or Malassezia dermatitis. Investigation for endocrinopathies should be considered in middle-aged dogs with recurrent pyoderma (with or without pruritus) that responds 100% to antimicrobial therapy only (no use of steroids). Note that dogs with these endocrinopathies may not show other signs of the disease: for hypothyroidism, lack of lethargy, heat-seeking behavior, weight gain; for hyperadrenocorticism, lack of polyuria/polydipsia or elevated liver enzymes. Collect bacterial culture samples from 3 lesions (papules, pustules, crusts, or epidermal collarettes) on the same swab, which increases the likelihood of identifying different strains of Staphylococcus with different susceptibility profiles that may be present, and submit it for an aerobic bacterial culture and sensitivity. Note that a bacterial culture may be collected even if the dog is currently receiving antibiotics. Discontinue the antibiotic; otherwise, you are enhancing the environment for development of resistant bacteria. Increase bathing to daily, or as frequently as possible. Consider applying chlorhexidine spray and/or Dakin’s solution daily (see Dakin’s Solution). Schedule recheck appointment in 10 to 14 days. Treat the infection based on culture results and begin to determine the initial or underlying cause of the infection (which is beyond the scope of this article). Combine 2 oz of household bleach (5%–8%, without fragrances), 32 oz of water, and ½ tsp of baking soda. This solution should be prepared daily. Avoid applying to areas near mucous membranes. 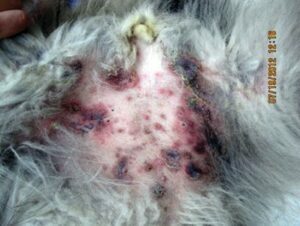 If the Secondary Bacterial and/or Yeast Infection Has Resolved but Pruritus Has Not Resolved, evaluate the dog for potential CAFR. Use topical parasite preventives or have oral ones compounded since there are currently no unflavored oral preventives available. Administer a tapering dose of oral prednisone (see Table 2) if the dog’s pruritus is severe and of significant concern to the client; use only oral prednisone/prednisolone and avoid long-acting injectable steroids. Schedule recheck appointment in 30 days, making sure the dog has not received steroids for 7 days prior to the appointment, which allows you to evaluate how the diet alone is controlling the pruritus; see Table 2). If the Pruritus Has Resolved, it is important to perform a dietary challenge, which will help determine whether the resolution of pruritus is directly associated with the diet change. Re-institute the previous food; if CAFR is present, the pruritus should recur within 14 days. Return to the elimination diet if the pruritus recurs; the pruritus should resolve in 14 days. Implement a hypoallergenic commercial dog food if the pruritus resolves. If the owner would like to continue with the home-cooked food, make sure it is balanced since most are not nutritionally adequate. Note that a veterinary nutritionist can play an important role in determining the best diet for a pruritic dog with CAFR. Extend the food trial for another 30 days. Dispense another 21-day course of oral prednisone (Table 2) if the dog is unreasonably pruritic. Schedule a recheck appointment in 30 days. If the Pruritus Has Resolved, return to step 5 and follow the directions for the diet challenge, implementation of a long-term nutrition plan, and potential consultation with a veterinary nutritionist if the owner wants to continue feeding the home-cooked food. If the dog does not respond to the food trial and the pruritus recurred once the owner tapered or discontinued the steroid, the diagnosis is eAD, which will require client education on long-term management of the disease. Frequent bathing and moisturizing of the dog; there are many excellent products available for use including: DermaLyte Shampoo and DermAllay Spray (dechra.com), Allergroom Shampoo and Humilac Spray (virbacvet.com), Dermoscent Spot-On (aventix.ca), and HyLyt (efa) Hypoallergenic Shampoo (bayerdvm.com). Essential fatty acids (EFA) to help moisturize the skin; EFAs may also have some anti-inflammatory properties. Allergen-specific immunotherapy (injectable or oral). Is less expensive for the client. Olivry T, DeBoer DJ, Griffin CE, et al. The ACVD task force on canine atopic dermatitis: Forewords and lexicon. Vet Immunol Immunopathol 2001; 81:143-146. Willemse TA. 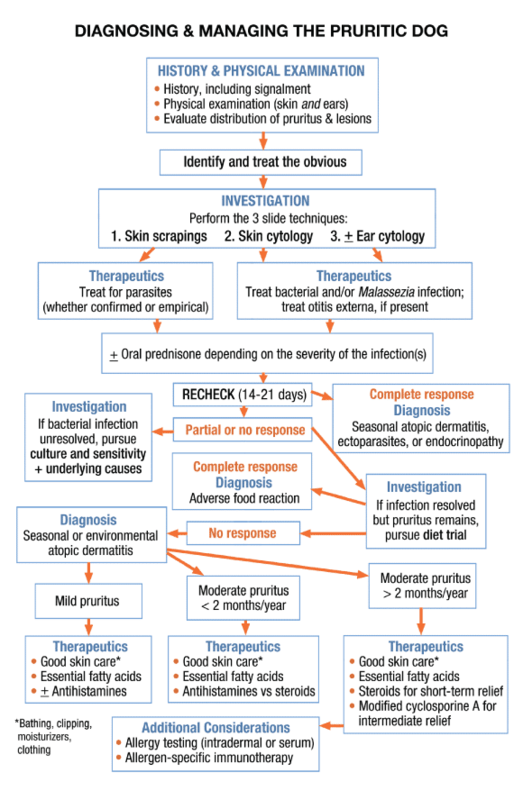 Atopic dermatitis: A review and reconsideration of diagnostic criteria. J Small Anim Pract 1986; 27:771-778. Prelaud P, Guague` re E, Alhaidari Z, et al. Re-evaluation of diagnostic criteria of canine atopic dermatitis. Revue de Medecine Veterinaire 1998; 149:1057-1064. Favrot C, Steffan J, Seewald W, Picco F. A prospective study on the clinical features of chronic canine atopic dermatitis and its diagnosis. Vet Derm 2009; 21:23-31. Murayama N, Nagata M, Terada Y, et al. Contact time of 2% chlorhexidine acetate for canine superficial pyoderma. NAVC Proc, 2011, p 236. How to Make Dakin’s Solution, available at http://woundconsultant.com/files/DakinsRecipe.pdf. Olivry T, Bizikova P. A systemic review of the evidence of reduced allergenicity and clinical benefit of food hydrolysates in dogs with cutaneous adverse food reactions. Vet Dermatol 2010; 21(1):32-41. Olivry T, DeBoer DJ, Favrot C, et al. 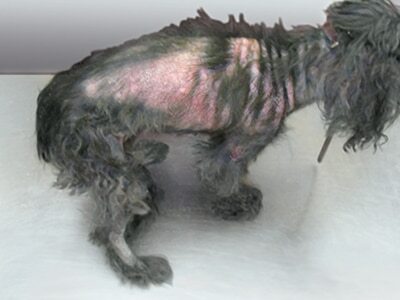 Treatment of canine atopic dermatitis: 2010 clinical practice guidelines from the International Task Force on Canine Atopic Dermatitis. Vet Dermatol 2010; 21(3): 233-248. Paul B. Bloom, DVM, Diplomate ACVD & ABVP (Canine and Feline Specialty), owns and practices at the Allergy, Skin and Ear Clinic for Pets in Livonia, Michigan. He also serves as adjunct faculty at Michigan State University College of Veterinary Medicine. He lectures at state, national, and international conferences and has written a number of book chapters. He serves on the scientific program committee for the American College of Veterinary Dermatology and is a reviewer for Veterinary Dermatology, Today’s Veterinary Practice, and The Veterinary Journal, where he is also on the editorial board. He received his DVM from MSU; he became Michigan’s first board-certified veterinary dermatologist in full-time private practice.